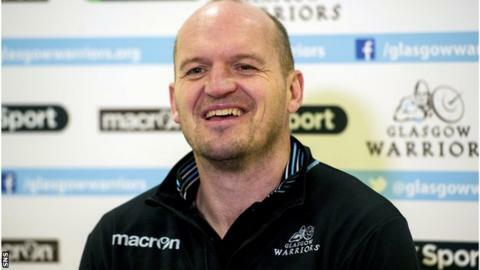 Gregor Townsend wants to see a positive reaction from his Glasgow Warriors side when they face Edinburgh in the second leg of the 1872 Cup at Scotstoun. Warriors must overturn a 12-point deficit if they are to reclaim the trophy - and Pro12 points - after a 23-11 defeat by their rivals last weekend. "We've got to be better," head coach Townsend told BBC Scotland. "There are a number of areas where we know we can improve. It'll be a very tough match on Saturday." Townsend feels his team did not reach anywhere near their peak level in the first leg but thinks Edinburgh's performance was a major contributing factor. "We obviously didn't play as well as we set out to play," he said. "Part of that was the way Edinburgh played. "You obviously have to deal with the opponents and not just put your own game in place. "The contact area we can be better. They managed to slow down our ball and we didn't look after the ball well enough. "We gave away I think 19 turnovers. They gave away 18 turnovers, so I'm sure they'll be looking to improve in that area too, but certainly you need to look after the ball in games like this." Warriors welcome back captain Jonny Gray after the Scotland forward missed last weekend's defeat, with Josh Strauss replacing the injured Adam Ashe at number eight. "Jonny being our captain and Josh being a key player for us over the last few years, it's great having them in the team, but we know we need a collective response at the weekend," added Townsend. "Within that, individuals playing as well as they can, but our team has to play much better."